SpamTitan uses predictive techniques such as Bayesian analysis and heuristics to identify new threats such as zero-day attacks and new malware variants. Embedded hyperlinks are also individually analyzed against six different Real Time Blacklists. The result is far fewer spam and malicious emails arriving in inboxes. Although most email services provide some level of proprietary spam detection, third-party spam filtering solutions will greatly improve spam email detection rates. The failure to implement an additional email security solution will mean spam and more serious email threats will still be delivered to inboxes. Office 365 is one of the most popular email services used by businesses, yet the security features often fail to block spam and phishing emails. Organizations that are used to dedicated security solutions with advanced filtering capabilities and detailed reporting functionality are likely to find Microsoft Office 365 default security options to be insufficient. Organizations looking for greater protection from email threats need to add an additional layer of security to Office 365. 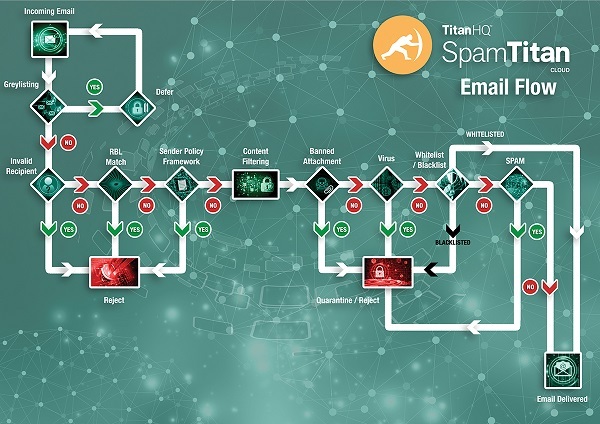 SpamTitan uses a variety of techniques to detect spam and malicious emails. SURBL filtering, Bayesian analysis, auto learning, heuristics, and malicious URL detection mechanisms are used on all incoming emails. These techniques result in a spam detection rate of 99.97%. 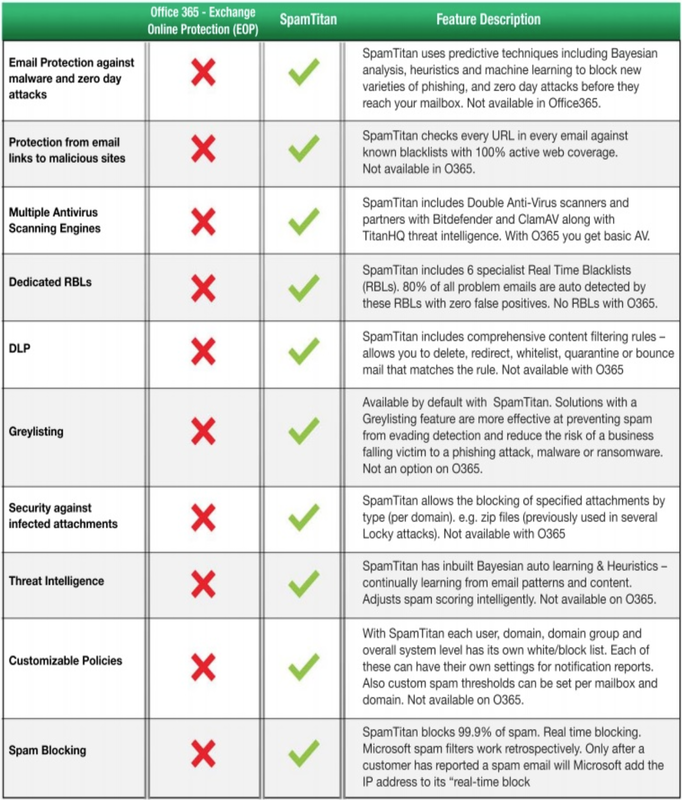 To protect against malware and ransomware, SpamTitan uses two leading AV engines. Along with other anti-malware controls, 100% of known malware is blocked and even new malware variants are prevented from reaching end users’ inboxes.